All donations will be awarded to non-profit youth running programs. "It is important that we get our kids into running programs," says Bob Anderson. 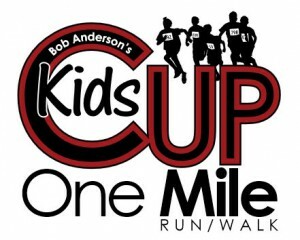 "We are holding the Bob Anderson's Kids Cup Mile at each Double Road Race location. The Kids Cup is for kids 13 and under. Special prizes will be awarded to the single age winners from 4 to 13 and to all kids who participate. We are hoping the Kids Cup Mile will encourage kids to be able to run a mile. It all starts with the kids." We would like to inspire people to live a healthier lifestyle, to encourage people to consider all aspects of health and wellness through nutrition, fitness, and lifestyle. We are interested in education and promotion of preventative health and wellness to our athletes, children, and communities. The structure of our event is different than others because it gives an opportunity to runners on all levels. Discover a new feeling, and accomplish something more. 100% of all donations collected at Double Road Races® will be donated to non-profit youth running programs. We hope you will help us get more kids running on a regular basis. We want to make running a part of their daily lives. At each location we will be staging a timed one mile race just for kids 13 and under. Prizes will be given to all kids who finish and special awards to the boys and girls winners of each age 4 through 13. Kids 14+ are encouraged to run the 5K Run/Walk (where available), or run the Double Road Race. Our youngest runner so far was 8 year old Lucy Hardy, who ran 1:29:39 in Overland Park, Kansas. Get the kids signed up! 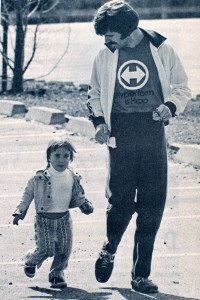 Race director and Double Road Race creator Bob Anderson (photo right) with his daughter Lisa in 1975. "My two kids grew up running. It was something we just always did. Our weekly Fun Run program we held at Foothill College was how we spent Sunday mornings," says life-long runner Bob Anderson. "Lisa is over 40 now and she loves running just as much as ever. It starts with the kids. Lisa's three kids, my grandkids, are growing up with running and love it. We are supporting programs we feel will encourage kids to start running." Run for the Kids The Double Road Race Federation is working with local schools and other groups that are promoting running to kids from the ages of 4 to 18. It is important to have kids make running part of their daily lives. Help us raise funds to help these program reach more kids on a regular basis. If you are interested in working with us to promote running to kids, contact Bob Anderson at bob@doubleroadrace.com to make a difference. One national youth running program we are working with is Just Run. If you have a worthy non-profit organization promoting youth running and would like to collaborate, contact us. JUST RUN! 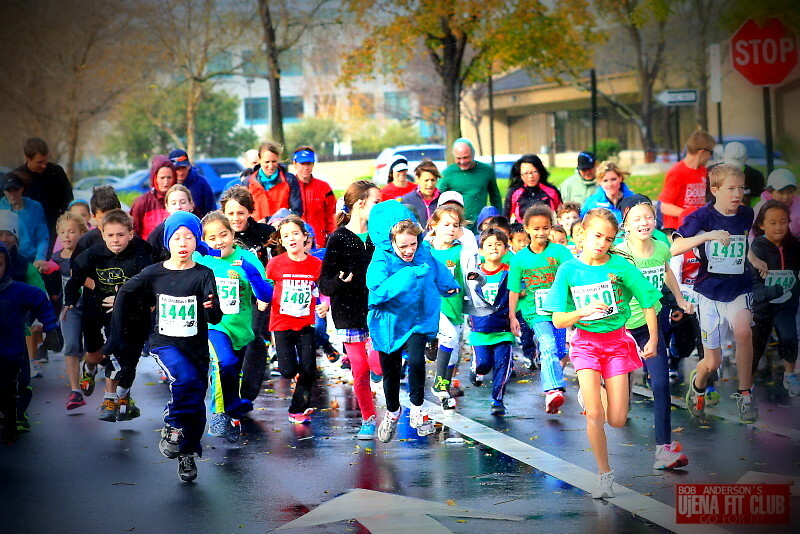 is a free, multifaceted youth fitness program developed by the Big Sur International Marathon. It not only promotes physical activity and the sport of running but good citizenship, healthy eating, and pride in accomplishment. Virtual runs across the USA and Europe link points of interest and geographical & historical sites, making it educational as well. This turn-key, website-based program is available for implementation in all schools and youth organizations, nationally and globally, and is easily adaptable for children of kindergarten age through high school. Participating schools have reported an improvement in both standardized fitness and academic test scores. JUST RUN’s success is based on several factors. Most significantly it addresses the vital need to combat childhood obesity while promoting physical activity. Because it is a FREE program, it offers a solution to financially strapped schools that are in need of providing quality physical education for their students. JUST RUN is an award winning program. It recently received the Monterey County Schools Board Association Award for “Excellence in Education” and was selected as a winner by the President’s Council on Physical Fitness Sports and Nutrition for “Community Leadership.” Endorsements during the past year were from two national fitness organizations, the Alliance for a Healthier Generation and the President’s Council on Fitness, Sports and Nutrition.